Wearing them and standing on them in these pictures. All that hard work paying off big time for Mr SGS - I reckon he does stripes just as well as Mr Boden! 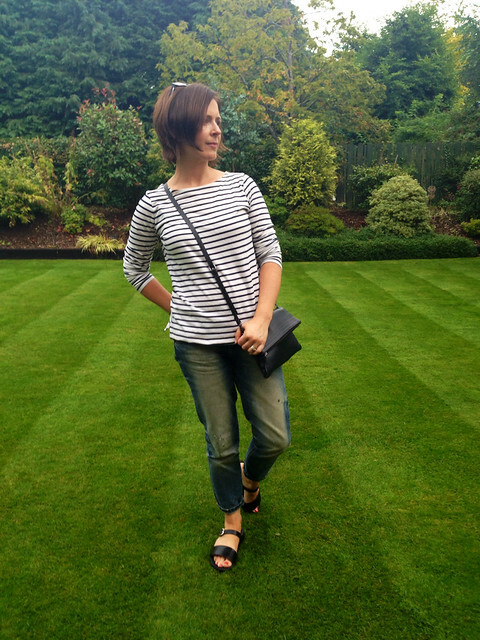 This is my favourite breton and a true wardrobe staple - the Boden long sleeve Breton in ivory/navy. It just goes with everything. Also wearing my Brooklyn Supply boyfriend jeans that I picked up for next to nothing in TK Maxx back in June - they're available here on the ASOS site and here at Zalando but for more than I paid unfortunately. Size-wise my jeans are a 28 and the Breton is a 12. And the FitFlops....so I've been wearing them now for a week after so many reader recommendations and while it's been super boring wearing the same shoes every day, I can't deny the comfort factor. In fact, yesterday, for a change, I put on some ballet pumps. I couldn't stick them for more than 30 minutes and putting on the Fitflops after being in regular shoes for just a short time was amazing...like walking on air! I can't say they're changing the pain in any way as I'm still on medication but I do get the sense that now I'm walking a little more each day, they're reducing the impact on my back...and I think they're kind of funky actually. Not everyone's cup of tea but they are a nod to the fugly pool slider style shoe that's been all over the high street this summer and I like that. They did take a couple of days to break in. I thought they were going to rub as I felt some stiffness around the front strap but after wearing for two days, that totally went and I didn't get any blisters or marks. Oh and size-wise, I do wish they did half sizes. I was advised to size up if between sizes, which I did and the 7 is fine. I think a 6.5 would have been finer though. All in all, I'm happy but the rest of my extensive footwear collection is feeling very neglected right now. Let's hope the good weather continues until my back feels well enough to move into non-fitflop territory, otherwise I'm heading for some cold toes as I'm not so keen on the FitFlop pumps...anyone tried them? Hope you're having a good week - back soon with a very belated holiday oufit run-through! I think you look pretty cool in your stripes Avril, great lawn stripes too. I really like the style of your fitflops, they work really well with your jeans, glad to hear things are getting better for you. 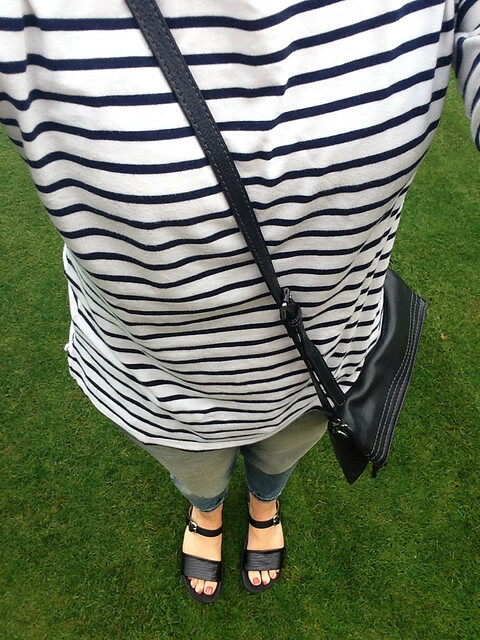 Loving this look, but then I do love a good stripe. Great casual yet chic look. I must admit I've not tried the fit flops as yet but have heart great things about them. 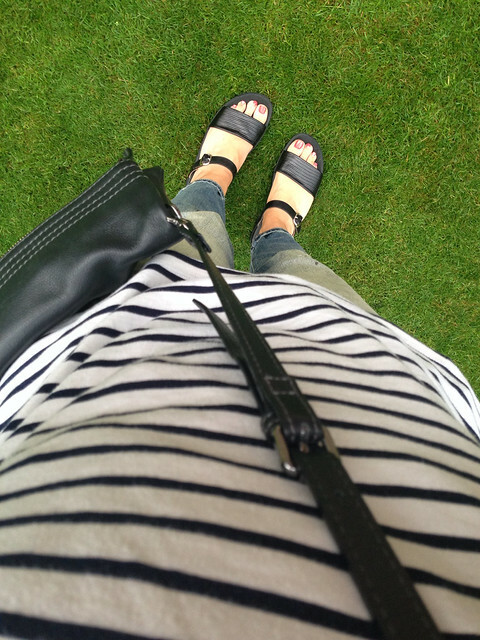 I need a new one of these boden tops, mine is 4 years old now but it's the nicest stripe top I own! I'm so glad that you are finally feeling somewhat better - and to be fair, those fit flops fit in beautifully to the fugly trend shoe of this summer. Your husband's lawn is a work of art by the way!! Fitflops will help reduce the impact in the long run, can't understand why people don't like them, they are the ideal shoe for mums on the run! The breton is lovely too just off to buy one now! This is the perfect casual outfit - you look effortlessly stylish but also comfortable, too. Love it! 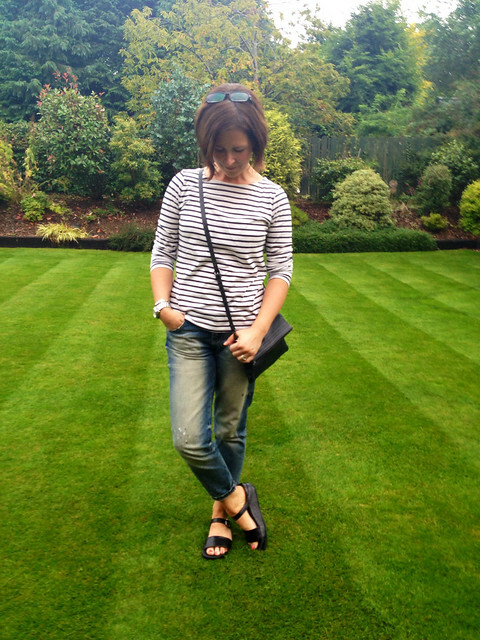 Loving the look but then I just love stripes myself! Wondering if I could ask a big favour of you + your readers? I'm desperately trying to find a mascara that doesn't come off - waterproof preferably as it's my son's wedding next month and you can probably imagine what an emotional day that's going to be! I've tried a few out already but even the waterproof ones leave a 'smudge' line under my eyebrow - I either look like I've got two eyebrows or that someone has given me a slightly black eye! Surely there must be a good mascara out there that does not move..... and that's where I'm hoping you + your readers could help? I've only got just under 7wks to find one ..... after starting my search about 4mths ago! I have that Boden breton too. So glad the fitflops are a success and hope your back improves soon. How are the fit flops for width? I have very narrow feet and find the regular style too wide, is this style any narrower?